Can you really get free cell phone lookup information? You are here: Home / Uncategorized / Can you really get free cell phone lookup information? 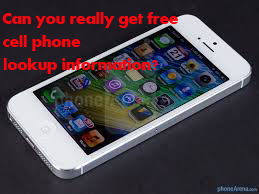 Why do you suppose so many people are looking for free reverse cell phone lookup information? I mean really, there are literally thousands of searches every day on all the various search engines from individuals trying to get free cell phone number reverse look up information. I ran some statistics on Google and found that in a typical 24 hour period over 750 people type in the term “free reverse cell phone directory”. Ok, I’ll clue everyone in to a secret. There is no such thing as a free reverse cell phone directory, none, nada, ziltch. And, if there were, the data would be junk. The only way to really find an accurate name or address from a cell phone number is to hire a professional. Yeah, there are some web sites like a1peoplesearch.com that offer free reverse phone searches and granted they have some cell phone info (albeit rare). If you need truly accurate info, and you don’t want to spend dozens of hours doing search engine searches until your fingers fall off, or are tired of clicking through dozens of useless links, you’ll soon realize there are only a hand full of professional information retrieval services online. A professional information retrieval service will have a “contact us” page or similar on their web site which includes a contact form or email address as well as a REAL phone number where you can call and speak with someone within a reasonable time period. There are also dozens of web sites that are link farms or offer low discounted prices and no customer service. Always remember the saying, “you get what you pay for”. So when looking for free cell phone lookup searches that saying will definitely ring true. Going back to my stats from search engines like Google, I thought it would be interesting for people to see just how many people are searching the following phrases in a 24 hour period. It’s mind boggling to think this many people need to find out information about cell phone numbers. This is a list of terms related to cell phone searches phrases performed in Google in August 2007 with the projected number of times the search was requested in a 24 hour period. As you can clearly see, there are a lot of people looking for free cell phone information. I truly wish there was a way to deliver accurate information for free, it’s just not possible. Here’s how cell phone information ends up in private databases that charge industry professionals like private investigators substantial monthly fees as well as transaction fees to access their databases. Keep in mind, there is not just one private company that obtains cell phone numbers. There are dozens if not hundreds of companies that warehouse and mine data. If you have any type of “club card” and used your cell phone number on your club card, it is likely that those companies sell information to “marketing companies”. Financial institutions sell or share personal information but offer a way to opt-out if you read the fine printed privacy notice. If you really want to keep your cell phone number private, just remember; never use it, never tell anyone your number, never write it down, never put it on business cards, never use it to order pizza, never give it to any business, etc..
You get the idea, it’s pretty much impossible to keep your cell phone number out of these databases. You’d have to change your number often or just never give out your number to anyone. Thousands of companies are compensated for all personal information they sell, trade, or share somehow. This information doesn’t come free, but it’s available. Some of the private data companies will offer free information online, however the databases they typically offer for free are historical or contain older information. Keep in mind that old numbers or outdated information is still viable, but it doesn’t really help the majority of people looking for the most current information. The bottom line is; if you want to get current, accurate, up-to-date cell phone searches, hire a professional. If you don’t hire the “bestpeoplesearch” company, please be sure you are dealing with a legitimate organization that returns emails and phone calls. Also be sure whoever you hire to conduct your cell phone search requests has a satisfactory Better Business Bureau track record and is a BBB member in good standing. https://www.searchbug.com/info/wp-content/uploads/2011/04/data-broker-e1509489779428.jpg 315 772 Noah W https://www.searchbug.com/info/wp-content/uploads/2018/10/SearchbugLogo500x197-e1540304996302.png Noah W2007-08-05 14:14:002018-08-19 22:57:16Can you really get free cell phone lookup information? so there is no free way with out a credit card to find out who this cell phone number belongs to? There are very few if any free reverse cell phone search options. Most of the online resources that advertise free reverse cell phone lookup searches really just try to sell you access to a multitude of databases. Some of these cell phone databases claim to be a cell phone directory but in reality are probably not updated on a regular basis and are just a bunch of cell phone numbers obtained from various resources. Basically you get what you pay for so if it’s free, it is probably not going to be very current. You can try http://www.a1peoplesearch.com which offers a very inexpensive reverse cell phone search from an online database or if you want guaranteed accurate information, you can hire a professional investigator using our reverse cell phone search from http://www.bestpeoplesearch.com. Alright. I can not search for the information and receive accurate results without being charged. It is illegal for anyone who is not an FBI agent and/or Law Enforcement Officer, etc. to obtain private records such as these, and even then they must show cause. Out of curiosity, what method are you currently using to provide us this information? I’m not sure what law you are quoting when you say [“It is illegal for anyone who is not an FBI agent and/or Law Enforcement Officer, etc. to obtain private records such as these, and even then they must show cause."]. Our investigators do not conduct any illegal searches. Everything they do is 100% legal. We are unaware of any law that prevents someone from obtaining the name and address associated with a cell phone number as of this date. It is illegal to obtain cell phone records (like incoming and outgoing calls). But a reverse cell phone lookup does not offer that information. This is simply a search to see if the investigtor can locate a name and address associated with the phone number you have. If you are unsure about what you need or want to discuss your particular case please feel free to call us during support phone hours as posted on our contact us page. Good info on this subject and agree that you get what you pay for. reverse phone directory apps to NSA spying technology. With all of the telemarketers and scams going this day, nobody wants to answer their phone blindly. But yet everybody wants to know who called them..hence the reason for googling phone look up or buying services. I had a comment that someone tried to publish and they asked a question but since the user tried to enter an anchor text link back for their name instead of a legitimate name I didn't publish it. What type of report do you provide here? I have a site that does the same thing and my site runs about 93% correct if you base results on refunds. Do you provide refunds for people if they are not satisfied? While there are many sites that offer reverse phone lookup services, there is no cell phone directory. So if you include refunds in your base results that means 7% of your customers are paying for nothing. I visited the site you promote and found that it is just an affiliate site for phone detective. Nothing special. I've been in the data industry for over a decade and have seen countless affiliates come and go. The only way to really test a service is by requesting information on an invalid or known number. For example: Running the phone number 555-234-5678 tells a lot. While your site shows nothing as shown here http://bit.ly/ijPgTA a good reverse phone lookup will tell a story. While SearchBug.com is over 99% successful finding accurate names from landlines most sites fall below our 30% – 40% success for cel phones. That's where hiring a professional investigator to conduct a verified reverse cell search comes in handy. Many times it might be a wife that has the phones in her name and wants to find out where her husband is… Do Not tell me that there is no one out there that wants to know!!! This would be helpful, especially if the wife is paying the bill!!! So, How may wives want to know???? Their is an app for the blackberry phones called white pages mobile, its not completely free but it costs around $6 and once you own it you could get unlimited cell number searches free. Cell phones that are not published wont show up. Basically whatever shows up on your caller ID when that cell phone calls a landlines phone that information will be available, so if the phone shows wireless caller then that’s what this app will give you but if the caller ID shows the persons real name the app will give that to you. There is no such thing as a cell phone directory. Since thousands of new cell phone numbers are issued every day and a proliferation of prepaid cell phones, we see less than 30% of cell phone numbers have names or addresses associated. It is very rare to find good data without the help of a private investigator. When it comes to reverse cell phone lookup information, you get what you pay for. It is really important to know who calls you, but make sure to think twice if you are being offered with free cell phone lookup information. It is important to look for paid services because they can offer you with a peace of mind. Yeah sure. I entered our PUBLISHED company phone number 760-454-7301 in the “spam” link you provided and it wanted $15 for basic access or $40 for advanced access, plus if you are not careful when you look at the form there is a pre-checked box authorizing you to charge me another $4.95 for stuff that is typically free most other places. We think it’s a total scam to charge for publish numbers. That’s why Searchubug has been providing free access to published number since 1997. Your credibility is also a factor since this is the only comment in your profile for now. I tried searchbug and they had no info on ANY number I entered,including my own. We have a collection of millions of searchable public records dating back to fifteen years. Our records are updated on a monthly basis, but since we don’t own the records we cannot control when a record is added. Public records are created in a variety of ways including but not limited to magazine subscriptions, store reward cards, mortgage records, utility records, and other publicly shared information. If you are not participating in sharing your information actively, you may not have new public records being created often if at all, causing the lack of current information on record for you or other numbers you may have searched. Unfortunately, since 2006 it is against the law to obtain call records without consent from the party or a court order. We know that the Internet can reveal countless of free services online. However, I don’t just believe that there are such companies that offer their expertise for free. This is the reason why we need to be cautious when we choose a service to lookup for cellular numbers and expect some charges to pay later on. Can you find a cell number if I provide a Name and address of a person. Do you have a plan by the month for unlimited searches ? Thanks. Thank you for your inquiry and comment. We do have a Basic Free People Search which will allow up to ten free basic searches per day, but honestly, it’s rare to find a cell phone number in free databases. While there are different ways to search, depending on what information you already have to use including; name, address, phone number, and Email locating cell phone numbers is a bit more difficult. We also have a Premium Membership which includes unlimited basic searches (which I think is what you were asking) but you also get access to our premium records which are aggregated public records and contain much more detailed information. Again, it’s often difficult to find cell phone numbers unless your subject uses a cell phone when completing publicly available documents and forms (e.g. mortgage deeds, magazine subscriptions, grocery rewards, online contests, and other county, city, or state documents that make their way into publicly available repositories). With that said, if you really need to locate a cell phone number, and you want to try searching our premium records to see if you can find it, it’s a low cost solution as it’s only $9 per week and you can search up to 100 searches per day (almost unlimited based on how much information is available). If you can’t locate the cell phone number for your subject using our premium one-week membership, have a look at our professional assisted searches. Investigator assisted searches can locate cell phone numbers from name and address. These searches are much more accurate since locating cell phone numbers is rarely easy with most unlimited database systems. There is no such thing as a cell phone directory like published phone numbers in phone books. Often data companies take phone books and digitize them for web lookups. The cell phone locate is conducted by a professional licensed private investigator and has a no-info refund available. The above link will take you to the search if you don’t have your subject’s Social Security Number. If you happen to have the SSN, simply enter that information in the field and it reduces the price. Most of our customers that absolutely need to locate a person’s cell phone number use the above search. Investigators that conduct these searches have over 2 decades of experience in locating difficult to find people. If you’d like to discuss your needs before ordering or have any further questions please call our toll-free support number at 800-990-2939 between M – F from 7:00 am – 4:00 pm PST. Noah Weider when you direct us to http://www.a1peoplesearch.com/ it just leads back to Searchbug.com. You KNOW this and do it anyway? Scammer. We purchased the assets of A1peoplesearch.com a few years ago and forgot to remove this link. If this caused any confusion it was certainly unintentional and we do apologize.